It's so much fun it's scary! Frightfully good deals and ghoulish fun for all. Join us once again for our Halloween Spooktacular! Come sit and sew and enjoy refreshments and spooky movies! Come in costume and receive a special gift. 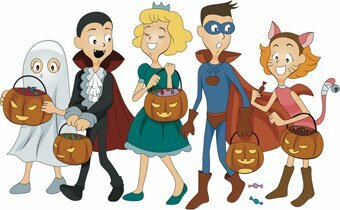 Shop specials every hour and best costume wins a prize! Also, everyone who signs up will receive DOUBLE points . . . even on sale items. Sign up for your seat soon. Only $5 for this whole day of in-store sewing. Click HERE to reserve your spot. Last year we filled up, son don't miss this fun event! Even Misty has a costume!